The Terrace Concept by Cuscini Design is a combination of retractable roof pavilions that are joined together, and designed and assembled in Mirabel, Quebec. Following the success of the fixed Pavilion and retractable Cabrio on the residential market, and in order to respond to the growing demand of the hospitality sector, the Terrace Concept was created! 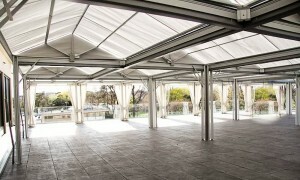 Equipped with a retractable roofing system, the Terrace Concept offers two attractive options: an open sky or comfortable shade, in addition to a complete protection from the elements. The use of a terrace or patio is no longer dependant on weather conditions, which in turn produces better business and increased profitability for the hospitality industry. The main advantage is that it allows for a larger sitting room area (maximizing the use of the outdoor space), and welcomes an uninterrupted flow of revenue which continues throughout the seasons. As a result, the terrace can be opened earlier in the Spring and closed later in the Fall.